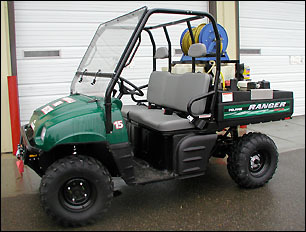 The Paynesville Area Fire Department has a new vehicle for fighting fires, a Polaris Ranger four-wheel-drive vehicle. The Paynesville Area Fire Department has a new vehicle for fighting fires, a Polaris Ranger four-wheel-drive vehicle, thanks to the generosity of a grateful family. The new $8,000 vehicle, which carries a 70-gallon water tank and a pump, will be ideal for fighting grass fires, but it can also be used as a search and rescue vehicle, for ice rescues, or to reach remote areas where driving a truck could be difficult. A firefighter committee - Bob Liestman, Ron Mergen, Jamie Soine, Roger Torborg, Mark Guenther, and Jack Winter - chose the vehicle and volunteered about 150 hours outfitting it. This vehicle was chosen because it could carry three people and enough gear to fight a grass fire and still go 30 to 40 miles per hour.